With eating this common food,worms can invade your brain. Once they are consumed and enter your organism, they can move throughout your body — your eyes,your tissues, and most commonly your brain. It is true that it is a classic parasite, but a dangerous one and it can get into your head. 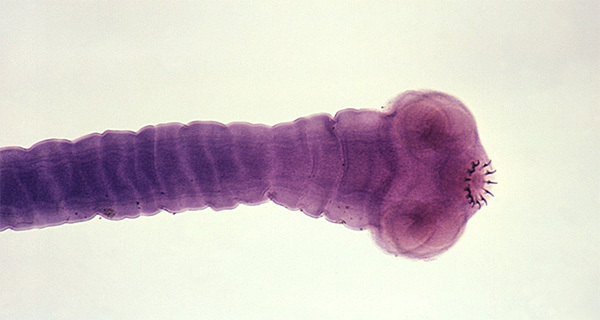 Dr. Effrossyni Gkrania-Klotsas said that while examining the head of a British man in 2013 they found a tapeworm. Until then they had never seen this tapeworm in the United Kingdom. The team of doctors at Addenbrookes Hospital at Cambridge, 4 years before that, had a patient – a man with first experienced symptoms, such as headaches. But after a short period of time the patient returned. This patient, a Chinese descent who had recently visited China, which along with Thailand,Japan and South Korea, had most of the regular occurrences of the parasite known as Spirometra erinaceieuropaei. Gkrania – Klotsas said “When the patient returned, he had all new symptoms”. The worm was now pushing through to a new part of his brain. It started causing weakness in his legs and seizures. In fact, the condition associated was the infection Sparganosis. Upon diagnosis doctors had to be quick to remove the worm surgically, because there is no known drug to effectively treat the infection. 300 infections of the Spirometra tapeworm were recorded in the period between 1953 and 2013. Infections are thought to be more common among the population that has very little knowledge about worms,in some parts of Asia. Geneticist from the Wellcome Trust Sanger Institute, in Cambridge, Dr.Hayley Bennett whose team recently sequenced the genome of the rare worm, said “These worms are some of the most mysterious worms we have researched”. They know that this life cycle is more complicated. The form of the Spirometra tapeworm adult only occurs in the intestines of dogs and cats but as these animals shed they excrete the worm’s eggs in their feces,and the eggs can enter, and contaminate the water. The resulting juvenile form of tapeworm the larvaecan then stay in the water within certain small crustaceans for a long time or it can easily end up in snakes and frogs. Through direct contact with infected animals or ingestion, these larvae can invade humans. According to Gkrania – Klotsas, they had a patient in Cambridge who had accidentally drunk water whilst swimming in an infected lake. Bennett said “The larvae can encyst in the brain or any other place in the human body”. These cysts can cause blindness,paralysis, tissue damageor even death. Bennett hoped to understand these sequencing from the worm’s genes and the inner working of the worms to aid future treatment and diagnosis. Creating a drug just for this worm isn’t economically viable,because it is a very rare infection, but by comparing it to other similar tapeworms the researchers can see which other drugs might apply. They extracted small samples of the wormfrom the infected patient, which could act as future drug target as well ashelp recognize resistance to drugs. They will identify an exceptionally large genes and genome from these small samples. Bennett adds “You could also develop a diagnostic test”. The tapeworm can be found in many types of forms but 3 of them can readily infect the brain. Helena Helmby from the London School of Hygiene and Tropical Medicine said “It’s mainly the pork tapeworm that’s the main brain”. The first form of infection – is by consuming undercooked pork from infected pigs, resulting in taeniasis – an adult worm residing in the intestine. The second form of infections – is in the larval form, through contact with the feces of an infected human or pig, which can go further on infecting many tissues. It can result in a condition known as neurocysticercosis if the larval worm enters the nervous system, including the brain. This kind of infection can often cause epilepsy once inside the brain. The World Health Organization stated on this matter that almost a 1/3 of epilepsy cases in countries where the disease is native are people who were previously infected by neurocysticercosis. With poor hygiene and sanitation Neurocysticercosis infection flourishes. However with increasing numbers across Africa, Asia and Latin America, according to the World Health Organization, the global distribution of pork tapeworms is widespread. Gkrania – Klotsas has 3 patients in her care in Cambridge who have previously experienced neurocysticercosis. The treatment for Spirometra has been surgical until now, however, in Cambridge, Bennett’s team found some drugs, such as praziqantil, that could be very effective. These drugs are used against schistosomiasis (snail fever). Also certain drugs used against cancer were identified as potential treatments. The treatments with anthelmintic drugs are targeting the worm, although infections with pork tapeworms are common. About the risks from increased international travel and the global food trade are concerned both Helmby and Gkrania – Klotsas. With the rapid development of the food export and import, the risks of ingesting infected goods have increased. This is only one more reason why more vigilance with food inspection is needed. Helmby predicts more cases occuring in places where such infections have been virtually eliminated,like the United Kingdom. Gkrania – Klotsas said: “I’m confident there will be more of this in the future”, who has already seen patients infected without even going abroad. The infection goes together with the people, wherever they are. However they suggest to people that are planning to travel, to be more aware when visiting regions where infections are commonplace. The increasing number of infections can be controlled, if health teams are going to be ready for the consequences. Helmby said “The challenge at the moment is to be able to treat these infections.” A challenge where genetics researchers could prove invaluable, as their sequencing continues to unveil the secrets of these mysterious parasites.